Land­scape your yard, neigh­bor­hood and busi­ness effi­ciently and eco­nom­i­cally to help conserve water, reduce pol­lu­tion and increase habitat. Water is an impor­tant resource for our health, econ­omy, and ecosys­tem. Land­scap­ing prac­tices can impact the qual­ity of our water sys­tems and the quantity of water that we use. Cre­at­ing a land­scape that requires less fer­til­iz­ing, water­ing and mow­ing is eas­ier on the home­owner and ben­e­fits our local environment. 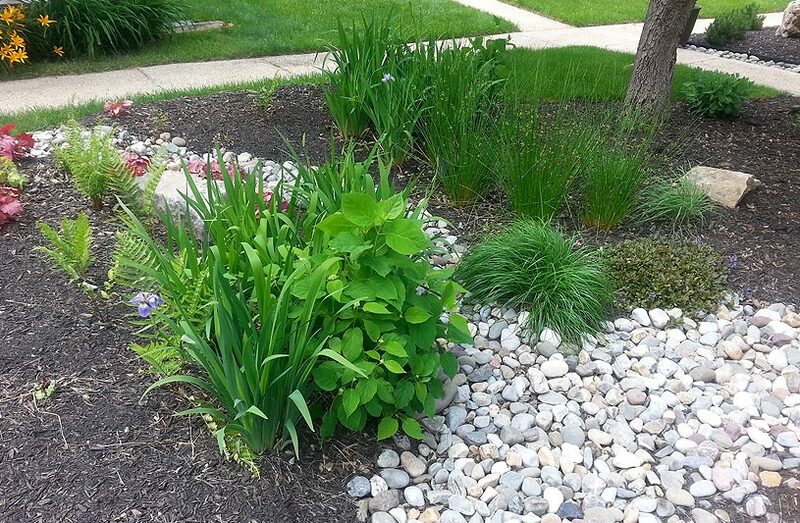 Land­scap­ing for Water Qual­ity: Con­cepts and Gar­den Designs for Home­own­ers, Adapted for Mary­land cre­ated by the Howard County Mas­ter Gar­den­ers is full of local infor­ma­tion and spe­cific tech­niques to make your yard beau­ti­ful and ben­e­fi­cial to the larger environment. The use of native plants in land­scap­ing, some­times called “Bayscap­ing” or “xeriscap­ing”, helps min­i­mize inva­sive species, the need for water­ing, and the use of fer­til­iz­ers and pesti­cides. Native plants require lit­tle or no addi­tional water­ing or fer­til­iz­ing, once established, and can aid in soil reten­tion, ero­sion con­trol, and water fil­tra­tion. Also, native plants pro­vide valu­able habi­tat for many native insect, bird, and mam­mal species in the region, as well as migrat­ing species. Con­sider cre­at­ing a back­yard habi­tat gar­den at home, school, or work using native plants to attract these species. Here is a link to the Howard County Mas­ter Gar­den­ers’ list of Mary­land Native Plant Sources. Also check plantbutterflies.org for native plant pocket cards, lists, plant­ing guid­ance and the Monarch Sis­ter Schools Pro­gram for help in set­ting up a but­ter­fly gar­den at your school. Check out the “Native Plant Passport”, created by Sonia He, a River Hill High School senior. The goal of the project is to plant more native plants in Howard County. To participate, purchase and plant 10 out of the 14 listed native plants on the passport and check off the plant and the nursery you got it from on the back of the passport. Completed Passports can be emailed to Julie Costantino and you will receive a coupon sheet with discounts to local nurseries such as Lowe’s, Sun Nurseries, Lauren’s Garden Service, and Grandfather’s Garden Center. Obtain your passport. How do you know how your soil is doing? Soil test­ing is easy and inex­pen­sive. It makes sense to find out if there is any­thing needed, before apply­ing reme­dies like fer­til­iz­ers and lime. Espe­cially when they are going to run off into our water­ways. If you hire a lawn main­te­nance ser­vice, make sure that they pro­vide a soil test. Extension’s Home and Gar­den Infor­ma­tion Cen­ter web­site is also loaded with great gar­den­ing infor­ma­tion that is spe­cific to our region. Drip irri­ga­tion, also called trickle irri­ga­tion, directs a slow release of water to the soil surface or directly onto root sys­tems. Spray irri­ga­tion, the most com­mon alter­na­tive, wastes a sub­stan­tial amount of water by evap­o­ra­tion and is not suit­able for most perennial. If you’re going to irri­gate, choose drip irri­ga­tion for a greener selec­tion, but con­sider irri­gat­ing and water­ing only newly planted lawns and plants. Remem­ber, the more you water your lawn, the more you’ll have to mow it. Mulch is sim­ply a blan­ket of organic mat­ter placed on the soil to insu­late and hold in moisture, and can include any­thing from wood chips to leaves to cof­fee grounds. Mulch is inex­pen­sive and it may be the best invest­ment you make in your green land­scap­ing project because it keeps weeds at bay much longer than com­post alone. The ideal mulch is a mixture of 50% com­post and 50% woody mate­r­ial, often avail­able at your local land­scap­ing center. Remem­ber not to choke your trees and shrubs by build­ing the mulch layer too high along the trunk or main stem. Instead, try to keep mulch level so the mulch can also absorb water into the tree root sys­tem at the base.